Getting There: Airlines that service Australia from the U.S. generally fly in and out of Sydney or Melbourne. These include American Airlines, United Airlines, Qantas, Ansett, and Air New Zealand. Most of these flights originate in Los Angeles. Qantas and Ansett both link Hamilton Island to Sydney. Web site links and phone numbers for these airlines can be found on this magazines Airlines page. Staying There: Most visitors to Australia enjoy several days in the Sydney area prior to additional travels. There are a number of lodging establishments close to the town center and the historical Rocks area near Sydney Harbor. Lodging on both Hamilton Island and Hayman Island is arranged through the single resort proprietor for each island. See the Web links below, or make a single call to Qantas or Ansett and ask for their vacation packages department to tailor the accommodations according to your specific price range and date preferences. They will provide the great convenience of being able to book all of your Australia accommodations, travel, transfers, and adventure tours with a single point of contact, at no extra expense. Recommended guide books for Australia are Fodor's Australia and Frommer's Australia, available through the Book Store. If you plan on doing a fair amount of snorkeling, we advise that you bring your own snorkeling gear to avoid problems in fit or other equipment problems. Also consider taking a thin wet suit with you to allow snorkeling for long periods of time comfortably, while simultaneously avoiding sun burn. Be sure to use sufficient high-protection, water-proof sun screen at all times of the day. Fast Facts: Australia is noted for its extremes. Most of its small population of 18 million residents reside on the southeastern coastline between Adelaide and Brisbane, along a 1,000-mile arc. Sydney is the largest city, with almost 4 million people in its metropolitan area. Australia is still a young country, starting from its modern origins as a British prison camp settlement in the early 1800s. The vast interior of Australia is one of the driest and oldest regions on earth, and home to the worlds longest-lived culture, that of the Aborigines. Many species of flora and fauna are found only in Australia, including the popular kangaroos and koala bears. The U.S. exchange rate is at an attractive level for U.S. tourists of approximately $0.65 to $A1.00. The Great Barrier Reef is the worlds largest coral reef, stretching for 1,200 miles along the northern half of Australias east coast, northward from the Tropic of Capricorn. It is the richest marine resource in the world. Titled as United Nations World Heritage Area, the Reef is almost entirely protected as Marine Park. 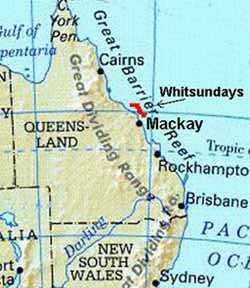 The Whitsunday Island chain sits at the north-south midpoint of the Reef. 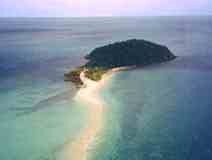 It is comprised of approximately 150 islands lying between the Queensland coast and the Reef. These are continental islands, fringed by individual coral reefs. Predominant vegetation includes eucalyptus, hoop pines, and grass lands. The majority of the islands are protected as national parks, and the populated islands still maintain their unspoiled flavor. The waters surrounding the Whitsundays are noted for great summer trade wind sailing, as well as ready access to premier snorkeling and scuba diving.